**NEW for 2013. 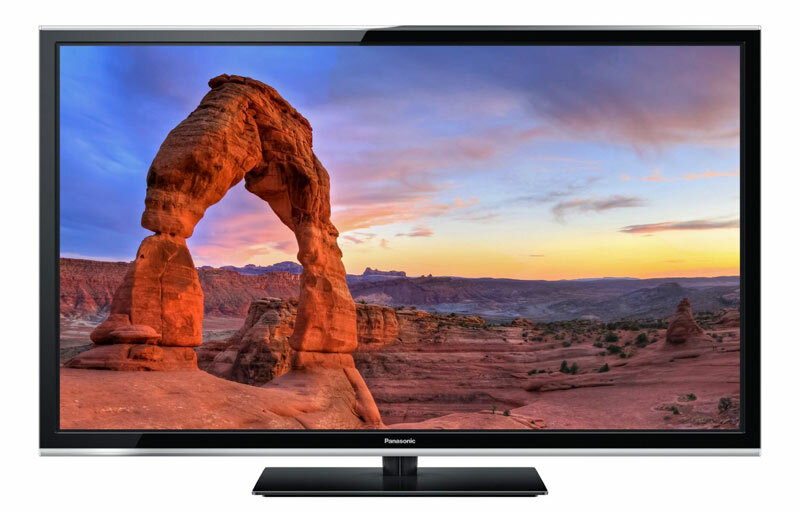 Panasonic’s low priced 65-inch S60 Series 1080p High-Definition Plasma HDTV. This is Panasonic’s best plasma TV without 3D. The 600Hz Sub-field Drive provides for fast motion from sporting events and fast action movies. Super Clear Resolution: With 1080p HD resolution and a fast image processor, Panasonic TVs reproduce video with stunning quality, bringing you high-res images with life-like colors. Features a 4,000,000:1 contrast ratio. Panasonic plasma TVs are legendary for their deeper, jet-black shades. Even in brightly lit rooms, deep areas and fine textures within dark scenes are rendered with exceptional detail. Supports 24p playback (3:2) for Movies. The 1920 x 1080 pixel Full HD screen has double the pixels of a 720p TV. It shares the 16:9 aspect ratio similar to movie theater screens, providing a theater-like experience at home. Swipe & Share 2.0 allows you to wirelessly transfer photos, video, music from your smartphone or tablet to your big screen TV with just a simple swipe of a finger. VIERA remote 2: allows you to control your TV with your smart phone or tablet. You can adjust channels, volume, picture settings, and more. Panasonic has discontinued manufacturing Plasma TVs, so the 2013 models will be their final year (while supplies last). Online Movies: Amazon Video on Demand, Netflix, Hulu Plus, CinemaNow, Youtube and more. Set can use ethernet or use the Built-in WiFi adapter to connect to the internet. The set has Two HDMI with Audio Return Channel (ARC) support, and one component inputs. Integrated NTSC/ ATSC /QAM tuners. Two USB 2.0 ports to view digital camera pictures, music and videos. DLNA CERTIFIED® to connect your home network. Two 10 watt speakers. eHELP User’s Manual is built right into the TV. Smart-Review Commentary: For 2013, Panasonic’s S60 Series offers a high quality plasma TV without 3D at a low price point. This is Panasonic’s lowest priced 1080p plasma tv. This set is internet ready and will allow you to access online movies, but does not have a web browser or social media access (if you require this, upgrade to the ST60 Series ). The set has a built-in wireless WiFi adapter, so there is nothing extra to buy. You can play media from a USB drive or camera by hooking up to the USB port, showing photos, movies, or playing music on the big screen. The S60 is DLNA compliant to allow you to use content from your PC and other devices on your TV. With VIERA Remote App Support, you can control your TV with your smartphone or tablet. We are impressed by the positive consumer/professional ratings on this TV. We also previewed this model at CES 2013 and it had excellent picture quality. The Panasonic TC-P65S60 is an amazing value for a very high quality 65-inch Plasma TV and is a Smart-Review Top Pick for 2013. Plasma TV Upgrade Option: ST60 Series Upgrade: If you upgrade to the ST60 Plasma Series, you get 3D Ready capability with 2 pair of active 3D Glasses, upgrade to a Full Web Browser and social media Smart TV functions, upgrades to the premium NeoPlasma Black panel with the upgraded Infinite Black Pro Filter. Upgrades audio to the premium VR-Audio Pro Surround. Adds an SD card slot and an additional HDMI port. Doubles the shades of gradation, higher contrast ratio (5,500,000:1), and adds the 2500 Focused Field Drive and Adds voice guidance/control.